Three actors portray seven characters, each with their own perspective on the event and its impact - including the 80-year- old neighbour who observes the world from her front gate, the man in mid-life crisis, a Russian minx and the innocent 4-year-old boy struggling too early with life’s harsh realities. 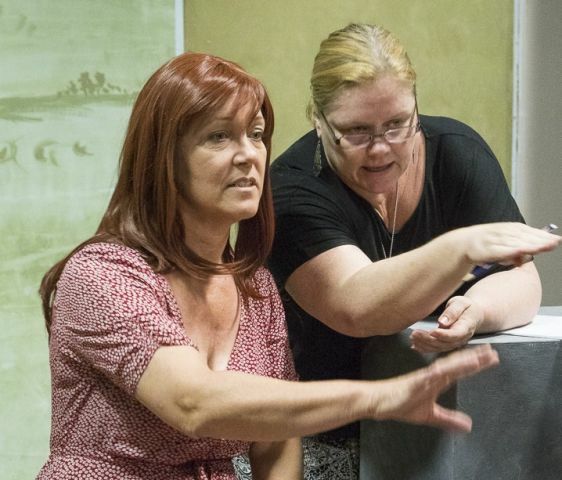 Director Racquel Boyd, who previously directed Sylvia for Pymble Players has assembled a cast of three talented actors, Faith Jessel, Judy Jankovics and Murray Fane to bring this Australian comedy to the stage. Rehearsal image: Judy Jankovics with director Racquel Boyd.